Enjoy the Zoo together! If you are planning a gathering for your church, business, civic organization, service club, family reunion, birthday or even a wedding, the zoo is an ideal location for you! The Racine Zoo campus offers various different venues for your desired event! 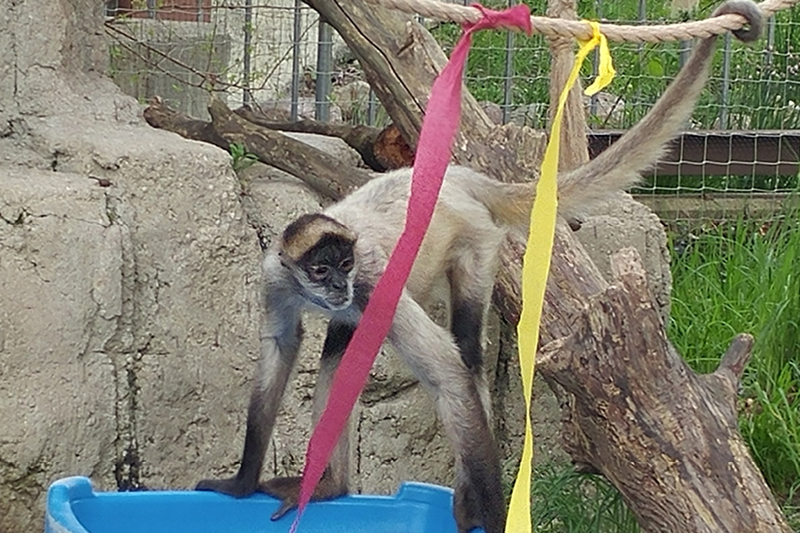 For birthday party reservations or questions, call 262.636.9580 or email us at asummers@racinezoo.org. 262.636.9189 or email us at info@racinezoo.org. In the heart of the Charles and Jennifer Johnson Land of the Giants, this durable canvas-sided tent is perfect for your event in any weather. With access to electricity and a prime spot right next to the PlayZoo Playground this location will make a great spot for your day of Zoo adventures! Rental of this space includes the two hours of time, Zoo admission with seating for up to 16 people and use of electricity. Centrally located in between the Zootique gift shop, Vanishing Kingdom and Max and Jenny's Jungle Grill, this open-air gazebo is the perfect location for your small picnic or party. Rental of this space includes two hours of time, Zoo admission with seating for up to 24 people and use of electricity. Right in the center of the Zoo, Meerkat Manor is the ideal location for your event. Close to Max and Jenny's Jungle Grill, The Junior League of Racine Zoo Choo Express Train Depot, and Barnyard Safari, this fenced picnic space is guaranteed to be a great time! Rental of this space includes two hours of time, Zoo admission with seating for up to 32 people and use of electricity. Your party guests will meet at the top level of the Zoo's main building (Vanishing Kingdom). This location is great for parties that are during a time of inclement weather and offered year round. Rental of this space includes two hours of time, Zoo admission with seating for up to 30 people and use of electricity. Nestled just north of our Andean Bear, this large open grass area offers plenty of room for your event. With abundant space, shady trees and a view of Lake Michigan, this site provides the ideal location for a relaxing afternoon here at the Racine Zoo. Rental of this space includes two hours of time, Zoo admission with seating for up to 40 people and use of electricity. This open lawn is the perfect location for your party. Conveniently located between the Junior League of Racine Zoo Choo Express Train Depot and the PlayZoo Playground this location offers plenty of fun for all ages! Rental of this space includes two hours of time, zoo admission with seating for up to 40 people and use of electricity. Right next to A.B. Modine Pond this scenic theater offers a unique opportunity for your next company function or meeting. With bench seating, a stage and electricity this location will take your event to the next level. Rental of this space includes two hours of time, Zoo admission with seating for up to 40 people and use of electricity. Our most versatile location, this pavilion on the Zoo’s far north side offers a picturesque view of beautiful Lake Michigan. Located next to the Charles and Jennifer Johnson Land of the Giants and the Play Zoo playground, this location is perfect for any event from formal fundraisers to backyard barbecues. With thick canvas walls that can be deployed at a moment’s notice your event is guaranteed fun, rain or shine! Rental of this space includes two hours of time, Zoo admission with seating for up to 50 people and use of electricity. Located in the northeast corner of the Zoo, this open area hosts large company picnics, wedding receptions, and even the Zoo’s very own annual black-tie fundraiser! Within close proximity to the Zoo’s resident giraffes and rhinos, this open area can be transformed to exceed your expectations. Rental of this private picnic area also includes the use of the Rotary West Safari Base Camp pavilion. Rental of this space includes two hours of time, Zoo admission with seating for up to 100 people and use of electricity.